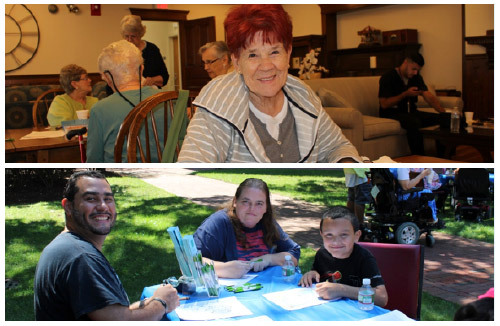 Lowell, MA (September 13, 2016) – In honor of the September 11 National Day of Service and Remembrance, residents of Market Mill Apartments, Rogers Hall Apartments and Mazur Park Apartments – Lowell apartment communities managed by full-service real estate firm Peabody Properties, Inc. – recently gathered to pay tribute to troops from Massachusetts serving overseas by participating in a letter writing initiative. During the 9/11 Service Project which was organized in partnership with Community Teamwork, Inc., more than 60 residents drafted 80 letters to show their support of active duty service members stationed outside the country. The letters will be delivered through the Massachusetts Military Heroes Fund of Boston, a non-profit organization dedicated to providing support to the families of military personnel with ties to Massachusetts, who have died in the line of duty post-9/11/2001. The letters contributed by the Market Mill, Rogers Hall and Mazur Park residents will be included in the 500 care packages that they assembled for Massachusetts troops currently deployed around the globe, veterans in need and Gold Star families. Pictured above (top): Rogers Hall Apartments resident Connie Mercier. (bottom) Market Mill Apartments residents William Cruz, Sue Harmon and Alex Cruz.